The sergeant picked up a card, which lay beside the dead man on the floor. The initials V. V. and under them the number 341 were rudely scrawled in ink upon it. "What's this?" he asked, holding it up. Barker looked at it with curiosity. "I never noticed it before," he said. "The murderer must have left it behind him.""V. V. -- 341. I can make no sense of that." The sergeant kept turning it over in his big fingers. "What's V. V.? Somebody's initials, maybe. "The clothes are commonplace," remarked Holmes, "save only the overcoat, which is full of suggestive touches." He held it tenderly towards the light. "Here, as you perceive, is the inner pocket prolonged into the lining in such fashion as to give ample space for the truncated fowling piece. The tailor's tab is on the neck -- 'Neal, Outfitter, Vermissa, U. S. A.' I have spent an instructive afternoon in the rector's library, and have enlarged my knowledge by adding the fact that Vermissa is a flourishing little town at the head of one of the best known coal and iron valleys in the United States. I have some recollection, Mr.Barker, that you associated the coal districts with Mr. Douglas's first wife, and it would surely not be too far-fetched an inference that the V. V. upon the card by the dead body might stand for Vermissa Valley, or that this very valley which sends forth emissaries of murder may be that Valley of Fear of which we have heard. So much is fairly clear. And now, Mr. Barker, I seem to be standing rather in the way of your explanation." 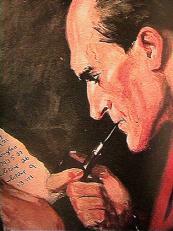 This site is dedicated to my father "Malcolm Brown" who introduced me to the delights of Sherlock Holmes.